Brazil has the reputation for having the best beaches in the world. 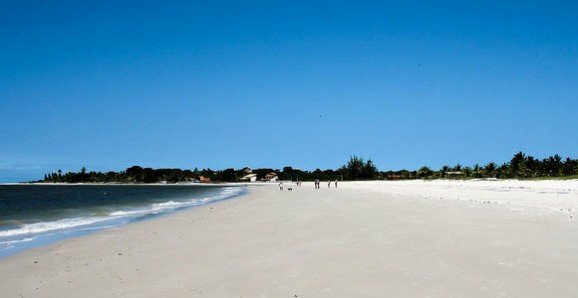 Ask a Brazilian and they will tell you that Ceará has the best beaches in Brazil. We cannot disagree. Kitesurfers and windsurfers have long kept this stretch of coastline a secret. Looking east and west and seeing virgin beach stretch as far as the eye can see, you have to wonder how they kept it secret for so long. In places along the coast, these wide, white-sand beaches are reminiscent of parts of Florida’s coast—without the crowds. Serving as the glimmering centerpiece for the state of Ceará (on Brazil’s northeast coast), the capital city of Fortaleza is our top destination in Brazil right now. Thanks to the state’s investment in roads and infrastructure—as well as the Department of Tourism’s current publicity campaign—tourism in the area has jumped 25% in less than two years. Fortaleza boasts its own beautiful in-city beaches, a sizzling nightlife, and great restaurants. The city has three sides: its old historic center and non-touristy downtown areas; a gleaming in-town stretch of beach with great waterfront restaurants and highrises; and quieter sections of beautiful, palm-lined white-sand beaches reminiscent of the Caribbean. The seaside boardwalk is cheerful and bustling day and night, with joggers, strollers and swimmers. It hosts one of the region’s best artisan handicraft markets, with hundreds of artisans showing their wares. It’s a combination of lifestyle choices that’s pretty hard to beat. Just two blocks in from the beach, is a 1,000-square-foot apartment, with two bedrooms, two bathrooms, maid’s quarters, balcony, and garage space. Price: $83,800 (R$145,000). In the Iracema neighborhood (close to the beach) is a new 14th-floor apartment with 774 square feet of living space for sale. It has ocean views, two bedrooms, two bathrooms, and one parking space. Price: $112,700 (R$195,000). 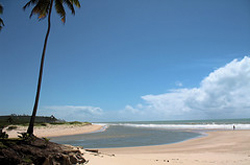 Located between Recife to the south and Natal to the north, João Pessoa is the easternmost city in the western hemisphere, and is often called “the city where the sun rises first”. This clean, modern, and cheerful city of over 670,000 has a lot to offer. It’s as nice as any coastal city you’ll find in Brazil—nicer than most—yet it operates at a noticeably slower, more easy-going pace. João Pessoa holds the title of the world’s second greenest city (according to the UN), thanks to almost 1,300 acres of Atlantic Rainforest within the city limits, as well as numerous parks and tree-lined streets. João Pessoa is also the safest capital city in Brazil, with reference to crime, and the air in the city is reputedly some of the cleanest worldwide. The oceanfront boardwalk along the palm-lined beach is alive and energetic, with the ever-present coconut stands and juice bars, as well as an artisan market and a number of waterfront restaurants. There are always plenty of people jogging, biking, or just walking along chatting. The beachfront road even closes each day between 5.30 a.m. and 8 a.m. to make room for everyone. We find the relaxed and healthy atmosphere here to be refreshing. Over the past two years, João Pessoa has really taken off as a second home destination. What was once an overlooked city, is now in demand by Brazilian second-home owners as well as the IL readership. Just south of the beach area of Cabo Branco, the Antiplano neighborhood is the latest hot-spot for developers and investors. A new project there, due for delivery in 2014, includes three-bedroom, three-bathroom, 947-square-foot apartments with ocean views and luxury furnishings, in addition to a long list of amenities, including bike paths and movie house. Price: $142,500 (R$246,500). A new apartment is for sale in the heart of the Tambaú neighborhood, with ocean views and 700 square feet of living area, including two bedrooms and two bathrooms. The building has garage swimming pool, a gym, and barbecue facilities. Price: $161,850 (R$280,000). The process for buying property is simple but somewhat different from elsewhere in Latin America. Here more than anywhere, it is worth having good, competent legal counsel. Engage your lawyer in the process before you sign anything. Make an offer and come to terms. This is done rather informally when compared to the U.S. The initial offer in Brazil is usually conveyed by phone or in person. At this stage, you and the seller will agree in principle to a price and any general terms. Get your CPF card. This will be your permanent tax ID. This is a simple process, and most attorneys can do this for you quite easily. Often a real estate agent will obtain it free, as part of the transaction. Prepare the promessa de compra e venda. Your attorney or real estate agent can draw this up for you. It’s good practice to have your attorney review it, and if you don’t speak Portuguese, you should have it translated into English; or at least have an English-speaking attorney or realtor “walk you through it”. Present the promessa de compra e venda (the final offer/agreement) to the seller. Now that you’ve got everything in writing, the seller will want to see the final product before he signs it officially. Execute the promessa de compra e venda. This can be done in the presence of a document notary. The promessa is not normally publicly recorded. Make the required down-payment. The payment is usually transferred directly to the seller’s account, within the period of time specified in the promessa. In order to retrieve the funds, the seller must present the signed promessa, to prove where the money came from and its purpose. Down payment is normally 10%, but can be negotiated. We’ve seen them as low as .75% with developers, and higher in private sales. Create the escritura. The preparation of the escritura will be done by the notary. Make final payment: Again, this is transferred directly to the owner. Register the escritura with the registry. Registration is done with a “property notary”. There are no restrictions on foreign property buyers who are purchasing urban land, beachfront properties, houses, or condos. Foreigners have the same rights as Brazilians, and residency is not required. There are, however, restrictions on foreigners who wish to buy large tracts of rural land used for agricultural purposes. If you’re considering a large land purchase, consult your attorney for guidance. The process for buying property in Brazil is simple but somewhat different from elsewhere in Latin America. Here more than anywhere, it is worth having good, competent legal counsel. Engage your lawyer in the process before you sign anything. Get your CPF number: You must obtain a tax ID (CPF) number to purchase a property in Brazil. This is not needed to execute a sales contract, but will be needed for the title transfer. Apply for title insurance, if you intend to do so. Title insurance brings peace of mind to many people buying in foreign countries, where the laws and local property issues are unfamiliar. Create an escritura publica, which will be the public record of the sale. This step is mandatory for any property valued at more than BRL$10,000. Pay the transfer tax, which is 2% of the value of the property. Take the escritura (and proof of tax payment) to a special notary who performs the recording of real estate transactions. This notary enters your property into the official registry. When buying real estate and property in Brazil, all transactions must be made through Brazil’s central bank. All money sent to Brazil must come through the official banking system, in communication with the central bank. Also, it’s important to note that when closing on a real estate purchase, the Brazilian bank that represents the seller can credit the money to him only if both parties have signed the contract. This means that if you transfer the amount to the purchase of an asset and the seller tries to change the conditions of the deal before the contract is signed, he will not be able to credit the value, and the money will be returned. An overseas investor can also purchase real estate in Brazil without leaving his or her home country. With a power of attorney given to a lawyer or other trusted party, the procedure can be held without difficulty. To obtain a power of attorney in a country outside Brazil, there is a procedure involving a local notary public and the Brazilian consulate in the jurisdiction of the investor’s residence. The representation of an attorney ensures the Brazilian property purchase process goes smoothly. 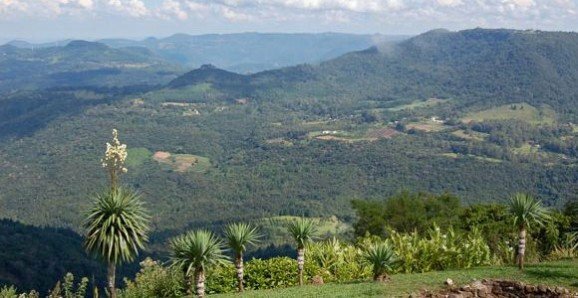 Can Foreigners Buy Property In Brazil? The answer to this question is a positive yes. The foreigner not only can invest in Brazil, but also is encouraged by the Brazilian government to do so. Facilities in obtaining visas and treaties to avoid double taxation are clear examples of the Brazilian government’s interests. But investors seeking to participate in the real estate, tourism, export, or environmental markets don’t have to worry about the restrictions. Closing costs will total about 4% of the purchase price, plus the cost of any legal fees or title insurance. The 4% breaks down as follows: 1% for creation of the escritura, a 2% transfer tax, and another 1% to register the property. Capital gains tax is usually 15%, paid at the time of the sale. Reinvestment of the gain into another property—and deferral of the tax—is permitted under Brazilian law. Condo fees are generally inexpensive by North American standards. For a typical condo project with a pool and basic services, expect to pay less than $80 per month. Property taxes will vary with the municipalities involved, but a lot beachfront condos are around $250 per year. IPTU is the property tax. It’s established locally in every city, but the amounts normally go from 0.5% to 1.5% of the evaluation of asset, depending on the use of the property and its location. ITBI stands for real estate transfer tax, based on the value of the asset or the evaluation of it. The amount is normally 2% of the base above mentioned, having to be paid in order to officially register the change of property before a notary public. To officially transfer the asset there are some other costs involved, such as the signature of a public contract and the register of the contract at a notary public, or Cartório de Registro de Imóveis (cost depends on the value of the asset). IR represents the income tax. The value depends on the amount of capital gain, since the rate goes from 15% to 25%. Note that there is a new bill establishing that in every five years a tax benefit can be used for capital gain purposes. This is generally for the seller of an asset with capital gain, and the reinvestment of the value obtained toward other real estate assets until 180 days after the sale. Why Is Brazil A Good Place To Invest In Real Estate? In the last five years, property values have doubled due to foreign investments, but the forecast of the growth to come is still very good for investors. Fortaleza is the No. 1 location for Brazilian tourists, and the number of U.S. and European visitors is increasing, evidenced by the growing number of international and charter flights and numerous international companies seeking to introduce regular direct flights to Fortaleza. The credibility of the state government is recognized by national and international institutions, which has allowed Ceará to receive credit for investments in infrastructure such as an international airport, which links Ceará with Europe and the U.S., as well as a port, which allows for import and export of merchandise to and from large ports around the world. A well-maintained road network linking the inlands and beaches supports the current growth, with potential for environmentally conscious investments, such as renewable energy (e.g., biodiesel, wind power, and tide power). Water supply is assured by means of a system that interconnects the state’s watersheds. Internet services can be found in even the more remote places, allowing for constant communication. In Fortaleza, medical care is available at costs well below the U.S. and Europe. Lawyers, architects, and engineers are accessible and affordable to assist with development. The local universities provide a large number of professionals. The work force is also very affordable. You can have a full-time housekeeper at your home for less than $300 per month. 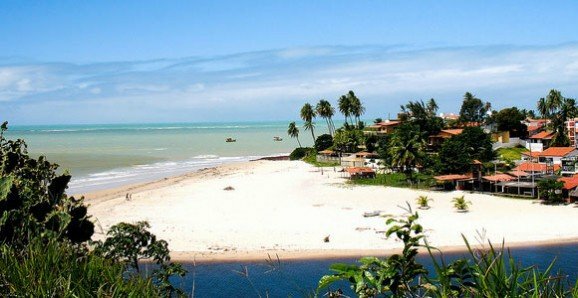 There are dozens of reasons why Ceará is the chosen vacation destination for Brazilians. Currently, Fortaleza and its neighboring beaches are receiving the most attention due to the low cost of properties and the potential return on investments. According to a national survey, of every 10 properties sold, three of them are being purchased by foreigners. That means that, at this very moment, 30% of the property, especially beachfront property, is in the eyes—or hands—of overseas investors. This growing demand is evidenced just by looking at the large number of enterprises currently under construction. The real estate market is just beginning to boom, and the options for potential investments are numerous: apartments, residential services, hotels, lofts, lands, and condos. Either for living or for making a living, the northeast coast of Brazil is growing fast.